The Mystery of Life! | Mk2 "The road's half travelled when you know the way"
← Just to be alive. Posted on October 17, 2017	by Bridie. to add to our consciousness. Leading to the discovery of new thought formulations. The Greatest knowledge you can ever have is your own. Then you do not have the ability to disown it. 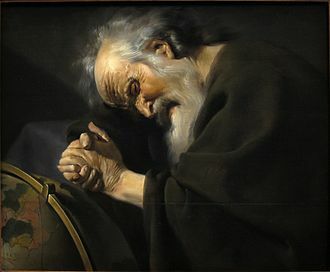 Heraclitus The weeping philosopher.. Courtesy of Google “free to use’ images. The proposition being that the panoramic phenomena of Mankind was unfortunately disposed toward a life that precluded them needlessly, from a state of consciousness beyond their experience. Heraclitus’s particular insight we can presume, was principally initiated by his intense interest in language composed of “unity of opposites”. (The Concept of Mind, Gilbert Ryle, p,17). Simply put, if you are alive then you have a measurable category of health, somewhere in the spectrum scale of health. It is preferable if we could turn our attention to the unity of principles that are the construct of every language we use. The uniting of opposites exposes the illusion that there are opposites. Through mindfulness it is possible to achieve an experience of their unity. That experience is always a construct of the whole – an absolute, or principle. By uniting the principal terms we can elevate the mew meanings we desire. Reasonable constructs and the proposed duality of established principles always lead toward that new meaning It is the only form of meaning that leads to its own extension – how else could it be? All principles (placeholders) have reciprocal value one to the other. No foundation principle can stand alone. They can only exist in union, the source of reciprocity. Unity as Absolute can never be singular. All absolutes are universal. There is no hierarchy beyond the meanings they evoke in their joint construction. The binary connotations, however they are commonly expressed, provide a constant reality beyond conventional consciousness. That experience is the immediate reward through disciplined application of their use. That discipline takes the form in all human action disposed toward the correct functionality of its associate welfare. The daily connections we make always include the distinct possibility of their recognition, when we make those connections in a mindful state. Association means at least one other 1+1=2. The perfect absolute reciprocal equation. Life is not composed of “your” mirror image. It is composed of “our” mirror image. That image defines our dependability, and our connectedness. Our evolutionary advantage is that language with all its complexities has already been created. A necessary reason of our lives, is the use of language to communicate the relationship we have with each other, and our understanding of that action. Universal meaning lies within the use of language without dichotomies, whatever language is used. Semantic translation without dichotomies will have the beneficial effect of finding common agreement, clarity of reason, and the release of historical embedded impediments. The exercise of uniting principle terms without dichotomies is imperative to break down crystallized concepts that are counter productive to individuals, and societies. Their effect would not be the changing of what is, but the experience of seeing reality as it is. Mindfulness semantics operate through you with their own agenda. Their binary properties and subsequent definition are of a dimension outside our conscious awareness. Mindfulness and healing are co-existent, and their activity is not personal property that function within the realms of our space-time-energy-matter domains. Look upon the practice of mindfulness as a social contribution whose effects may take their own manifestation. The double helix effect of mindfulness semantics is infinite, and adds beneficially to our collective consciousness. Personal benefit comes with the realization that change of being has taken place, and our functionality can develop. We evolve. Let it be. offer the reason I started to search for any data, ancient or otherwise on human consciousness, specifically related to Alzheimer’s. At 90 years of age (well past my used by date) it may well be that I am a candidate with a focus on my own pending dementia. If so, then the theory and the method I write about is holding it at bay. To address the health of my mind in this way could be the catalyst that retains its own functional activity. A semantic template can be created using data on both domains. No definition of absolutes or principles can be ill-defined. This entry was posted in Absolutes, Alzheimers, Consciousness, Dichotomies, Language, Mindfulness, Observation, Semantics, Uncategorized. Bookmark the permalink.